Writing feedback. I have a love/ hate/ love/ love/ hate/ appreciate/ dread relationship with it. I imagine most writers do. Of course we dread it. Which artist wants to pour their heart and soul and energy into their creative work and then have someone tear it to pieces? Even though I know– a thousand times over– that my editor is on my team, I still have major moments of panic when I read her feedback. Yet the love/appreciate part is very, very important. Without critique, my writing hits an early apex. I can’t push through to a higher, better, superior level of writing without the much-needed push from feedback. Writing group. Every month, I meet with three other novelists. Each of us are working on our own projects, and they’re all very different from one another. The week before we meet, we send each other what we’re working on– maybe a few pages, maybe a couple chapters, maybe a whole manuscript– and share what kind of feedback we need. The four of us get together, eat some soup, chat about life for a little bit, then dive into each other’s work. We start with one person’s work, and each other person shares their thoughts on it. We agree, disagree, discuss, brainstorm, and support. Before we move on to the next person, the person whose work we’re discussing gets to ask any questions she might have. And so on. This monthly meeting is so critical to me. It keeps me on track, keeps me accountable, keeps me motivated. It helps steer me down the right rabbit holes. When I leave, I can’t wait to get back to work. I’m lucky, I know, to have three talented writers in my life whom I can meet with in person, and I know it doesn’t work out that way for everyone. But I think that committed writers need to fight for this opportunity, whether that means seeking out local writers (even if you don’t know them!) or finding critique partners online. I thought this article from The Write Life was great: 40 Places to Find a Critique Partner. Beta readers. Yes, that’s right– in addition to my writing group, I also share my work in progress with a handful of other readers– some who are also writers, some who are not. I let them read my manuscript and tell me what tripped them up as they read. Obviously, it’s not fun to hear what trips your readers up– but it allows me to fix it. I think it’s helpful to have beta readers from a variety of different backgrounds, people who are excited about your writing, willing to read it, and able to share their thoughts (when possible, I recommend buying their lunch in exchange for their feedback). My editor. Ahhh, yes. Here I know I am privileged, of course, to have a genius editor at HarperCollins able to pour her brilliance into my work. But even before I was working with Jill, I still paid an editor in Minneapolis (Ben Barnhart, he’s great!) to read my work– for developmental, big-picture edits, and also for line edits. Not to mention writing workshops (I highly recommend the Big Sur Writing Workshop!) and copy editors (they amaze me). My point is simply this: if you want to be a good writer, write; if you want to be a great writer, seek out criticism, embrace it, and let it push you past your own limits. Criticism is not the knife; your writing is the knife. Criticism is the whetting stone against which you sharpen your stories. 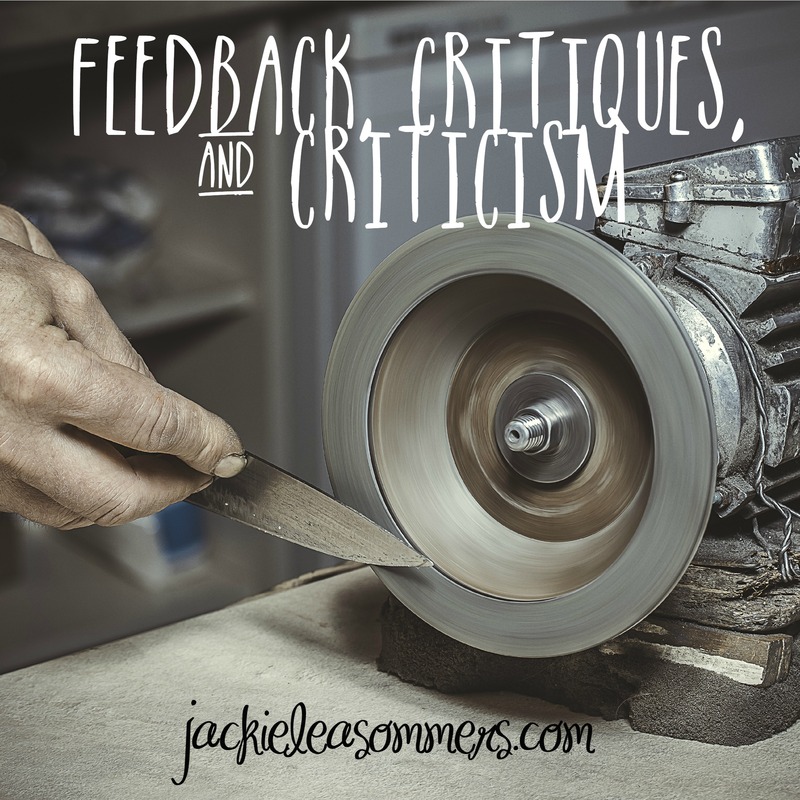 This entry was posted in writing, YA and tagged importance of feedback to a writer, jackie lea sommers thoughts on writing critiques, where to find critique partners, writing, writing criticism, writing critiques, writing feedback, writing ya novels by Jackie Lea Sommers. Bookmark the permalink. A wonderful strategy for great writing. Reminder to self as I *just* received my editor’s revision letter for book #2 and am meeting with my writing group tonight to discuss it all! how come i never get a free lunch for critiquing??? i LOVE Silas!!! Sisters don’t critique! Sisters rave!